Probiotic supplements are intended to help with digestive health, but in some cases probiotics may cause increased gas and bloating. The Cleveland Clinic reports that probiotics can help with digestion and protect the body from harmful bacteria by maintaining a balance between good and harmful bacteria. Probiotics are not intended for everyone and should be taken while under the direction of a medical doctor. Probiotics are microorganisms that naturally live in the digestive system that help maintain digestive health and regularity. 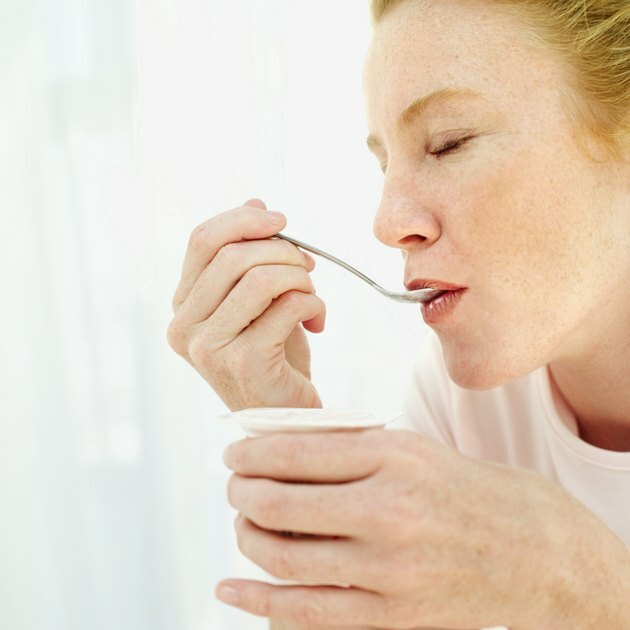 The 2008 issue of "Advances in Experimental Medicine and Biology" reports that even though more research is needed, probiotics may help boost your immune system, reduce your risk of developing cancer and diabetes, help treat intestinal infections and treat diarrhea and irritable bowel syndrome. Probiotics are also found naturally in yogurt, kefir and cultured milk products. Dairy products that contain probiotics will state that the product contains live and active cultures. People who are lactose intolerant may develop symptoms from using a probiotic supplement. Some probiotics contain from milk, which can trigger bloating, gas and diarrhea within a few minutes after ingesting the supplement. Lactose intolerance is a common digestive condition that occurs when your digestive system cannot properly digest the sugar found in milk, according to the National Digestive Diseases Information Clearinghouse. If you are lactose intolerant, use a dairy-free probiotic supplement or take a lactase enzyme supplement along with the probiotic to prevent any symptoms. If you have a milk allergy, a compromised immune system or artificial heart valves, you should talk with your doctor before using probiotics. A milk allergy can cause gas, diarrhea, nausea, vomiting and stomach pain and may lead to life-threatening symptoms, such as shortness of breath, a sudden drop in blood pressure and a racing heart beat. If you have artificial heart valves, you're at increased risk of developing a heart valve infection from using probiotics.